Recurrent Pilot Training Center Training Center utilizes one of the most advanced, state-of-the-art, simulation devices available today for our sim-based training programs. Our simulator training system permits students a full range of normal, abnormal, and emergency procedure training as well as advanced techniques such as GPS WAAS approaches. Recurrent Pilot Training Center Training Center instructors are also available for training at your location with your airplane. 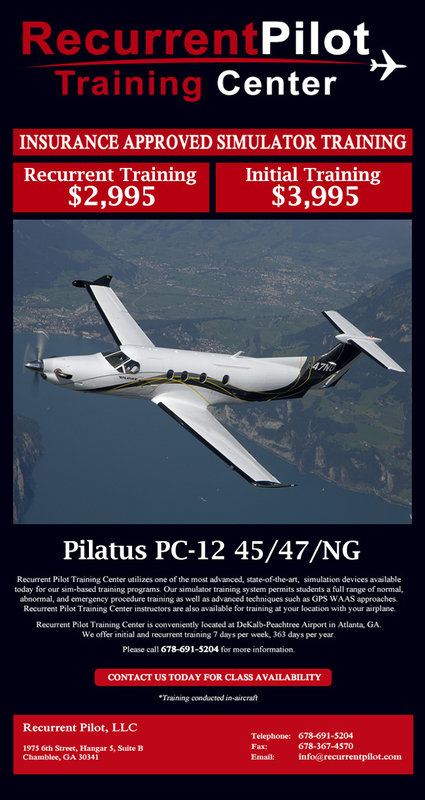 Recurrent Pilot Training Center Training Center is conveniently located at DeKalb-Peachtree Airport in Atlanta, GA. We offer initial and recurrent training 7 days per week, 363 days per year. Please call 678-691-5204 for more information.